Worst volcanic eruption in Japan for 90 years. On Saturday 27th September 2014 there was the sudden volcanic eruption of Mt Ontake, a volcano located around 200km west of Tokyo. The volcano erupted on a clear autumn day, at a time when at least 250 people were taking advantage of the beautiful hiking conditions. Whilst Japan is one of the world’s most seismically active nations, surprisingly, there haven’t been fatalities from eruptions since 1991 when 43 people were killed by a pyroclastic flow at Mount Unzen. 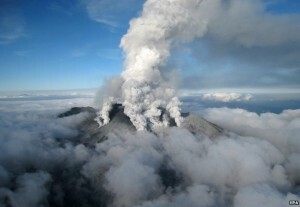 Mt Ontake, however, erupted without warning spewing ash and rocks, killing amateur climbers in its path. The eruption of Mt Ontake produced a huge pyroclastic flow which trapped 250 people on its slopes. The 3,067m high peak is a popular hiking route, dotted with lodges, cabins and well marked trails, hence why there were over 50 deaths (the majority being hikers near the top of the volcano). At least 40 others were injured during the eruption. The volcano’s sudden eruption forced many of the people on the mountain to make emergency descents through clouds of volcanic ash and falling rocks. Heavy, toxic volcanic ash up to 40-50cm thick covered much of the mountain. The huge cloud of ash billowed down the mountainside for more than 3km, engulfing hikers in its path (See video). According to eyewitnesses the eruption sounded like “thunder” and “the volcanic rocks fell like hailstones”. The visibility was completely reduced, and reports highlighted how many people were engulfed into total darkness for several minutes. 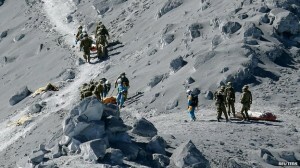 Around 1000 Japanese rescue workers (a mix of police, firefighters and military personnel) set out to search the peak popular with hikers after its sudden eruption that trapped hundreds on the mountainside. Those bought down the mountain were taken to the town of Kiso for urgent medical help. Recovery efforts were however hampered in the early stages of the rescue due to the volcanic conditions. The effort was halted as the volcano continued to shoot toxic gas, rocks and ash into the air. Residents over a large area were warned of the risk of falling stones. Why was there no warning? There have been many questions as to why there was no warning of this volcanic eruption. Volcanologists have pointed out that this was a relatively small eruption that was driven by super-heated steam and ash, rather than by lava being ejected from the magma chamber. This made it much more difficult to predict. There were also no signs of an immanent eruption, such as earth movements or changes on the mountain surface. While some seismologists noted increased seismic activity on Mount Ontake ahead of the eruption, they were still unprepared for what followed and the devastation it caused.